The local Genesis House shelter is run by Hands of a Friend, and is partially funded with proceeds from DaZee’s consignment shops. Serving as a “safe haven” for female victims of domestic violence and sexual assault, Genesis House has provided over 35,000 bed units since its opening in January 2007. The shelter currently has 24 beds, at an expense of approximately $32 each day. Victims range in age from newborns to 87 years old, and may stay in shelters for up to 24 months. Additional services provided by Hands of a Friend include: Poverty and Payroll program (an aid to employment development), parenting classes and child development aid, nutrition and health counseling, a GED program, computer classes, and medical and dental emergency work. Hands of a Friend Foundation and Genesis House Shelter are run entirely with volunteers. The founder/executive director and the assistant executive director work ten to twelve hours per day, six days a week, unpaid. Because Hands of a Friend is a faith-based agency, they accept no County, State or Federal funding. First, donate clothing and small household items to the DaZee’s consignment shops or volunteer your time at the shops, located at 231 Duval Road, just off of La Cañada near W. Duval Mine Road. Second, contribute financially through the church (or if your contribution is made directly to Hands of a Friend, up to $400/person or $800/couple may be used annually as an Arizona Tax Credit). Third, obtain the necessary required training and volunteer at Genesis House. 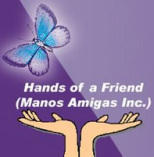 Find out more by clicking on www.handsofafriend.org​ to visit their site.